Alumnus Max Palevsky, noted art collector, campaign finance reform activist and recently retired director emeritus of Intel Corp., has pledged $20 million to the University to enhance the quality of residential life on campus. In recognition of his pledge, the University will name its new residence halls the Max Palevsky Residential Commons. The Max Palevsky Residential Commons will consist of three buildings designed by architect Ricardo Legorreta, who, this spring, was awarded the American Institute of Architects Gold Medal. A $53 million project, the brick residential commons will form quadrangles that will create a gentle transition from the University‰s Gothic buildings to the brick residential buildings of the surrounding neighborhood. Legorreta‰s signature use of color and light will highlight the common areas inside and outside each building. The Palevsky Commons, along with the Bartlett dining commons, will form a new center of campus activity around the Joseph Regenstein Library. The residence halls will house a foreign language media center, computer rooms, soundproof music practice rooms and accommodations for more than 700 students. Construction of the foundation began this spring. Designs for such details as fixtures and lighting are in progress. The University plans to open the buildings in the fall of 2001. Palevsky has been a pioneer investor in the high-tech industry since the 1950s and was one of the first major investors in Intel Corp. He was a founder and served as director of Intel from 1968 until his retirement last April. Early in his career, Palevsky left Packard Bell and, along with 11 other scientists, founded Scientific Data Corp. in 1961. According to Financial World magazine, as president of the corporation, Palevsky‰s ability to identify SDCs market and assemble a cadre of scientific researchers earned him status as a founding genius. In order to diversify, Xerox Corp. bought the company in 1969 for more than $900 million. Palevsky eventually left Xerox and went on to serve as chairman of Silicon Systems and then Daisy Systems Corp. In addition to his interest in politics, Palevsky is an avid art collector. He established the Palevsky Design Pavilion at the Israel Museum in Jerusalem. He built an Arts & Crafts collection at the Los Angeles County Museum of Art, and he also donated $1 million to establish the Los Angeles Museum of Contemporary Art. He was first introduced to the University during World War II, when he attended meteorological school in Chicago as an officer in the U.S. Army. After the war, he decided to enroll at the University because he was drawn to an environment that gave me an enthusiasm for all that is out there in the world, he said. Palevsky has maintained a close relationship with Chicago since graduating in 1948. 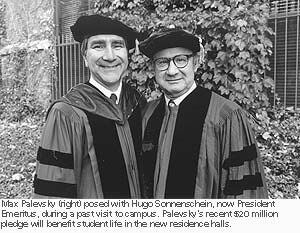 He established the Palevsky Professorship in History and Civilization in 1972 and the Palevsky Faculty Fund in 1996. His generous contributions to student life also include a gift that allowed the University to build the Max Palevsky Cinema, a campus movie theater and auditorium run by Documentary Films Group, the longest-running student film organization in the country. Palevsky also served as a University Trustee from 1972 to 1982. The Max Palevsky Residential Commons is part of the University‰s $500 million Campus Master Plan to substantially improve the Universitys facilities in the coming decade. Among the additional projects are the Gerald Ratner Athletics Center and adjoining parking structure designed by Cesar Pelli; a new Graduate School of Business designed by Rafael Vinoly; the University Press Building, which will open next winter; an enhancement of the Joseph Regenstein Library to accommodate 1.2 million more volumes as well as technological advances; expansion and improvement of the Oriental Institute; the Interdivisional Research Building, which will provide state-of-the-art laboratories for joint research projects crossing the boundary between the physical and biological sciences; and a permanent skating rink and warming house that will grace the Midway Plaisance.